4D have been singing together since May 2011. We are a large group of just over 80 singers meeting weekly. 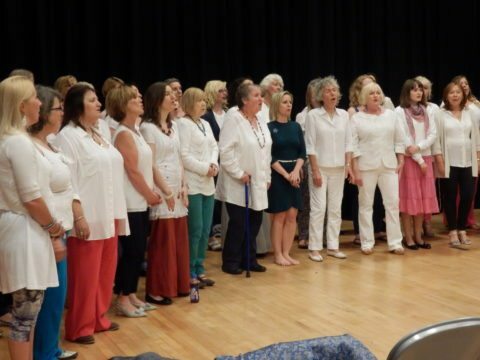 Led by Kate Davies and Carol Shephard, we sing unaccompanied arrangements of popular music songs – using our own arrangements and those of other NVN members. We perform once or twice per term. No audition, no sheet music, just voices. £85 per 12 week term. Here we are last Christmas at Marina Market Swansea. This year’s Charity Christmas Concert raising funds for local singing groups Sanctuary of Song and Swansea Carers’ Choir on 14th December 2016.